With six nights in the Canadian Rockies and two days on the Rocky Mountaineer, the Canadian Rockies at Leisure gives you time to relax and recharge. This package offers two days on the incomparable Rocky Mountaineer, motor coach tours and transfers as you explore the magnificent Canadian Rockies from Jasper to Lake Louise, Lake Louise to Banff and Banff to Calgary. Or, if you prefer, you can rent a full size car with unlimited mileage for your travels through the Rockies along one of the three most beautiful highways in the world. 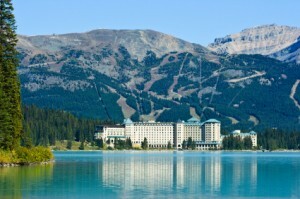 You’ll spend two nights each in Jasper, Lake Louise and Banff and one night in Vancouver, Kamloops and Calgary. 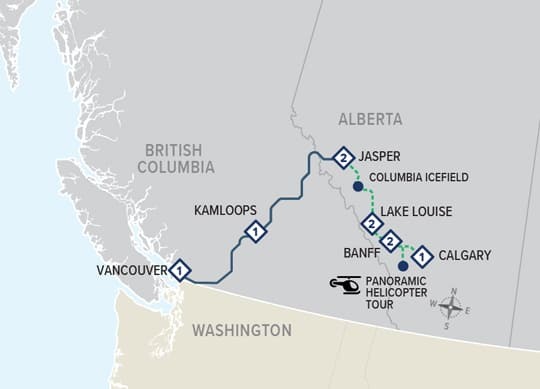 This vacation begins with an overnight stay in Vancouver on selected dates from April 15 to October 10, 2019. In 2019, this package is renamed as the Journey through the Clouds at Leisure. In 2017, this package was known as the Canadian Rockies at Leisure. Call 604-990-9299 or 800-913-9207 or Email us for specific prices, more information and reservations.